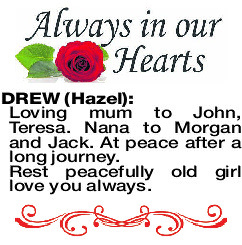 The Funeral Service for the late Hazel Jean Drew, formerly of Bentley, will be held in our Mareena Purslowe Chapel, 289 Albany Highway, Victoria Park at 10.00am on SATURDAY (13.4.2019). All who knew Hazel are welcome. DREW HAZEL Loving mum to John, Teresa. Nana to Morgan and Jack. At peace after a long journey. Rest peacefully old girl love you always.